Source/The Forum of Executive Women. 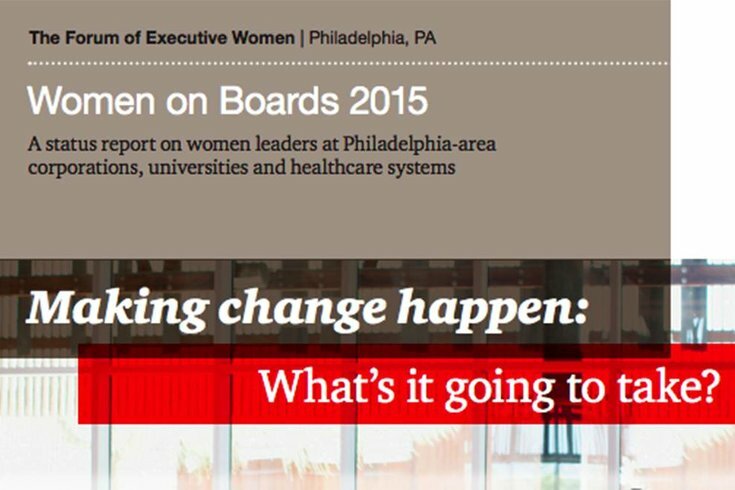 The annual Women on Boards report, titled "Making Change Happen – What’s it Going to Take?" and authored by The Forum of Executive Women, was released today. A report out Tuesday says little improvement was made in 2014 to bolster the number of women leading the region's corporations. The annual Women on Boards report, titled "Making Change Happen – What’s it Going to Take?" and authored by the The Forum of Executive Women, was released at the group's annual leadership breakfast. The report, done in collaboration with the Philadelphia office of PwC US, analyzed 2014 year-end SEC filings of the 100 largest public companies in Philadelphia to find that women hold 13 percent of board seats and 13 percent of executive positions – no change from the previous year. "The recurring lack of progress documented in this year’s report suggests that nothing will change by chance," the Forum of Executive Women said in a statement. "The report offers actionable strategies that companies and nonprofits can implement. It also highlights the ways that individual leaders, both women and men, can take personal responsibility in creating a workplace where high-level advancement is equally possible for both genders." Using Form 990 filings for 2013, the report found that of the leaders at 18 healthcare systems and 20 colleges and universities in the region, women held 24 percent of board seats in the region’s healthcare systems and 30 percent of board seats in colleges and universities. “This evolution to make change happen should be a priority for boards and in C-suites, in order for companies to unlock the possibilities of being more innovative in their business strategies for the future," said Deanna Byrne, assurance partner in PwC’s Philadelphia office. "The reality is that we are all connected, and realizing the full potential in an organization requires men and women to play active roles in each other’s successes." The full results are available online at www.forumofexecutivewomen.com.